This book introduces archaeologists to the most important quantitative methods, from the initial description of archaeological data to techniques of multivariate analysis. These are presented in the context of familiar problems in archaeological practice, an approach designed to illustrate their relevance and to overcome the fear of mathematics from which archaeologists often suffer. Introduction. Quantifying Description. Picture Summaries of a Single Variable. Numerical Summaries of a Single Variable. An Introduction to Statistical Inference. The Chi-Squared Test. Beyond Chi-Squared: Describing Association between Two Nominal Scale Variables. Numeric Variables: The Normal Distribution. Relationships between Two Numeric Variables: Correlation and Regression. When the Regression Doesn't Fit. Facing Up to Complexity: Multiple Regression and Correlation. Numerical Classification in Archaeology. Simplifying Complex Spaces: The Role of Multivariate Analysis. Probabilistic Sampling in Archaeology. Conclusion. Appendix 1: Statistical Tables. Appendix 2: Computer Packages for Statistical Analysis. References. Index. 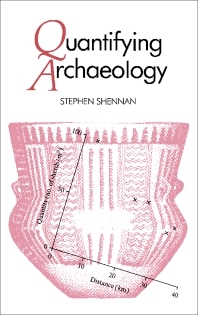 Dr. Stephen Shennan is a lecturer in Archaeology at the University of Southampton, where he has taught this subject to first-year students for several years.